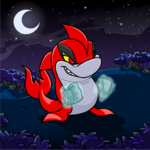 Once there was a red Jetsam, who was bigger, tougher and much, much scarier than any other Jetsam in all of Neopia. Whenever he was going into the battledome, he would put on his lucky Ghostly Blue Gloves and his hands would tingle, then his arms, until eventually his whole body felt tingly and powerful. Then he would make his way into the battledome and the crowd would cheer his name: "Red, Red, Red, Red, Red!" Then he would wipe the floor with the competitor, if they hadn't run off the moment they saw him walk in. The crowd would once again erupt, and rush in to congratulate him on his latest victory. "This is the life," Red sighed, as he shook hands with yet another of his "biggest fans". (Personally, Red didn't think this blue Mynci was very big at all, but he smiled anyway.) When, after almost half an hour, he had greeted each and every one of his fans in the audience, Red left the battledome and, as usual, Lou the Chia was waiting for him outside. "Come on, Redward, we haven't got all day!" he called. Lou was just about the only Neopet who still called Red by his full name. He was the family chauffeur, so he had known Red since he was as small as a JubJub. "Chop, chop! Quickly, hop on – we must get you home in time for dinner or Mrs Jetsam won't be happy!" He patted the back seat of his tandem and Red clambered on. The pedals in the front had had to be raised so that Lou's feet could reach them, and since he was, after all, being paid to take the family to wherever they had to go, the back pedals had been removed so as poor Lou had to do all the work. It was a funny sight for all of the nearby pedestrians: Red, the biggest, toughest, scariest Jetsam in all of Neopia all hunched up on the back seat of a tandem being driven about by the tiny, weak hearted old Chia, puffing and panting as he went. Sometimes Red would give Lou a hand, sneakily putting his flippers or tail on the ground and pushing along while they were going uphill. Really, Red would be better off just walking home by himself, or perhaps buying a bicycle, or even a unicycle (he had seen a Lenny riding one at the Lenny Festival a few years ago and had wanted to try it ever since – he felt he'd be quite good at it as his agility had been trained up at the Mystery Island Training School). But Lou didn't really have much money, and Red and the rest of his family knew that Lou needed this job to support his family as much as a Korbat needs its wings to fly. Eventually, they arrived back at the Jetsam family's house. "Thanks, Lou!" Red threw over his shoulder as he rushed inside. He ran in through the open door and was instantly overwhelmed by the wonderful smell of sausage and pepperoni omelette. "Mmmm... That smells great, Mum!" Mrs Jetsam smiled at her only son. "You're just in time. We nearly started eating without you!" Mr Jetsam walked over to where Red was standing. "That's alright, Son! Have a good day in the Dome, then?" he asked. "Never mind, you don't need to answer. I know you won – as always!" He grinned at Red, and Red grinned back. He was about to tuck into his omelette when his mum interrupted him. "No gloves at the table, Redward," she frowned. "Sorry, Mum," he sighed. He pulled his gloves off, being extra careful not to tear them and sat them on the table, then began to eat. Most neopets usually only eat one third of an omelette, but Red ate one third, then another, and then the last. Fighting really worked up an appetite! It also never failed to tire him out. He had barely finished his dinner when he felt a huge yawn coming on. "Yaaaaawwwn!" he went (or something like that, anyway), and stretched his hands and flippers. "I think I'll turn in early tonight. Goodnight, Mum. Night, Dad." "Goodnight, Son," his parents chorused in reply. In the morning, when Red awoke, he looked at his calendar (which had a great picture of his favourite Wocky band on it) to see who he was scheduled to be fighting that day. "Yes!" he exclaimed. "Gareth!" Gareth was a Grarrl, which was one of Red's two favourite species to fight, along with other Jetsams, because they were far less likely to run off in fear than any other type of neopet. This gave him more of an enjoyable time in the battledome and, although he always won by quite a substantial margin, it was nice to have a little bit of a challenge. He suddenly saw that it said the match was due to start at 11 o'clock – that was only an hour away! He had to get ready quickly. He ran to the bathroom and hurriedly washed his face before darting out the door to meet Lou, standing there waiting impatiently. "Come on, come on, we haven't got all day!" he moaned. "Sorry, Lou!" Red jumped on the back seat of the tandem and pushed off with his tail. "It's fine, it's fine – just as long as we get there in time!" There was still a good forty-five minutes left, but the journey was mostly uphill, and even on flat land Lou wasn't exactly supersonic. But eventually they did arrive at the battledome, with less than five minutes to spare. "There he is!" Red heard someone shout. "I knew he'd make it!" "Yes, I'm here... excuse me... pardon me... yes, I love you, too... sorry..." he muttered as he bumped into all sorts of neopets on his way to the Dome. He stepped into the Dome and the crowd erupted with cheers. "YES!" Red yelled into the massive arena. "I'm Reddy to battle!" The crowd cheered even more as he said his signature phrase. Suddenly the cheers turned to boos, and there were even a few hisses to be heard, mostly from Hissis, as Gareth entered the arena. Red made fists with both his hands and lifted them up in front of his face, into the ready (or "Reddy" position. He decided there was nothing he could do but take the chance and at least attempt to win. He was being silly – everybody knew that Red was the biggest, toughest, scariest Jetsam in all of Neopia... so why didn't he? He heard the countdown start. "In five, four, three, two," and then there was the usual temporary deafness as the Trumpet of Blasting marked the beginning of the battle. Red, not wanting to give his challenger any more advantages, quickly brought out a Poison Snowball and launched it at Gareth... but he missed! Everyone in the crowd gasped. Red looked around him at all the confused fans. What was he doing, embarrassing himself like this? He should have just pretended to fall ill and cancelled the battle. "Oww!" he cried. Red looked at his throbbing knee to see that he had just been hit with a 9 Pound Coconut. He looked up just in time to see an Exploding Snowball hurling toward his head. Red woke up with a start. "Oh, thank goodness," he breathed. "It was just a dream!" He got up to check his calendar and, sure enough, he really was meant to be fighting Gareth today. He then ran to the bathroom to wash his face and this time remembered to lift his gloves from where he left them – on the table in the kitchen. Once again he arrived at the battledome with less than five minutes to spare. But this time, when the Trumpet of Blasting sounded and he lifted his hands up to the ready (or "Reddy") position, he did have his gloves on. He still took the opportunity to throw a Poison Snowball at Gareth, though – and this time he hit, and wiped out a quarter of the Grarrl's Health Points. Gareth was just about to chuck his Diamond Snowball at him when Red slipped off his gloves and tossed them aside. The crowd gasped and Gareth was too taken aback to attack for a moment. Then he got back on track and threw the Diamond Snowball at Red's head. But the Jetsam caught it in mid-air. He looked at the obviously terrified Grarrl and grinned, showing off his massive teeth. Then he looked at the Diamond Snowball and tossed it from hand to hand a few times, giving the Grarrl the chance to run almost to the door before he flung it all the way across the room, hitting the back of Gareth's head. The snowball shattered into a million pieces... and took out the rest of Gareth's Health Points! As always, the crowd erupted and rushed into the arena, and Red smiled to himself as he realised that he didn't need any "luck gloves" – he could do whatever he wanted to, all by himself.